Fort Langley is a lively place on Friday nights. It was hard to find parking for the Fort Gallery which was our destination. It shines like a beacon when there is an opening on a fall evening. Once out of its protective circle of light, it’s deep black outside and difficult to navigate from car to gallery and later, back to the car. 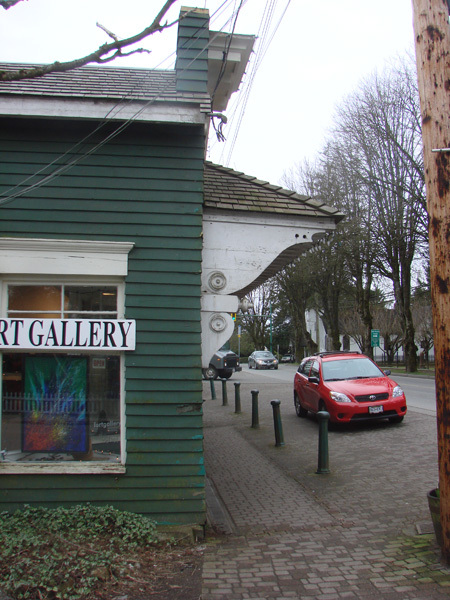 Inside, the gallery is hopping with some of the elite of British Columbia’s artists and many relatively unknown but top notch visual artists – ceramists, painters, sculptors. This is a gallery that artists like to frequent for it’s friendly atmosphere, whether there is an opening on or not, and its high quality shows. The walls are painted a soft grey which is a perfect background to dramatically show off paintings. Art work doesn’t have to fight with a harsh white background. 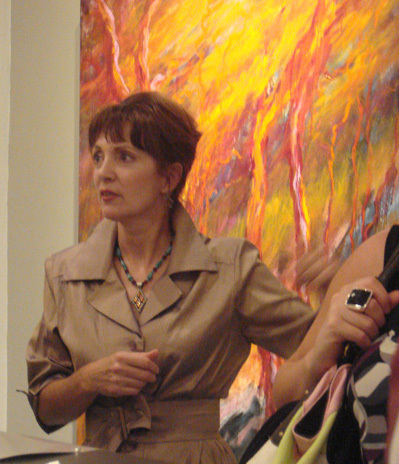 This evening was the opening of a show for Kate Bradford and Susan J. Falk. 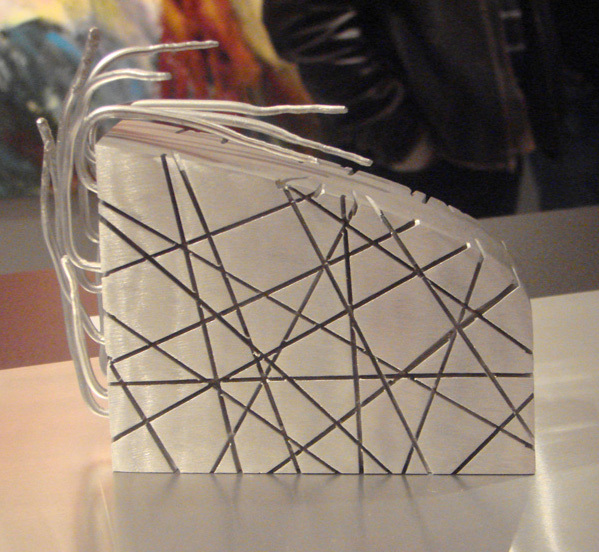 For this exibition, Bradford showed ten small sculptures varying in height from six to ten inches high, all a variation on a theme entitled Ridge. Each is a brushed aluminum block, some cubic, some in rectangular solid forms. Each one is incised or added to with variations. The main material is a pristine brushed aluminum with added metallic elements in copper, steel or brass. Where the basic element in the design is severe, even austere, the additions , contrastingly, are irregular in form and somewhat frivolous in comparison. It’s a fascinating contrast. Given the base rectangular solid form they are begun with, they end up looking like very elegantly designed but quirkily, wrapped presents. It’s very clear that Bradford knows her materials and lets them work for her. Lighting is the key to making these sculptures realize their full potential. 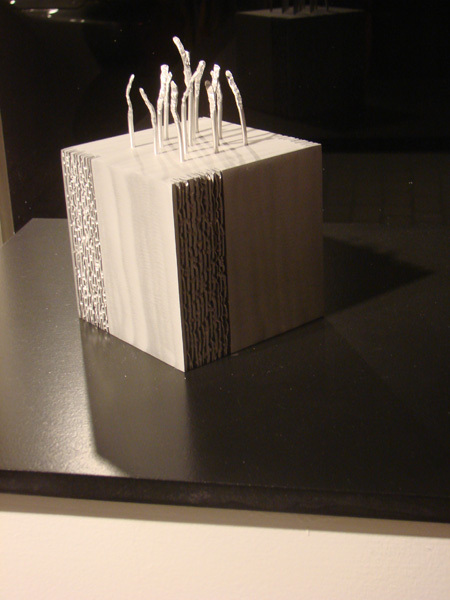 In the sculpture pictured above, light comes from two directions and the small posts weave shadows into each other, creating additional visual interest. The reflection and shadow cast by the block on its support, a uniformly black shelf, also adds interest. These sculptures suit a minimalist context such as a classy office reception area or board room, or they would grace a refined urban home with sleek modern furniture. Kate Bradford’s attention to precision and simplicity is a strong point. Her variations on a theme demonstrate that her work fascinates her. She is not repeating her imagery but finding new visual joy in each separate piece. On the surrounding walls, in great contrast to Bradford’s work, large canvases painted with liquefied oil paints depict arbutus trees in all their gracious fluidity. I was rather pleased with the warmth and liveliness of them. The imagery did not change materially from canvas to canvas, so it took an inspection of her web site to understand that, in this small gallery the viewer was too close up to appreciate that these canvases are meant to hang together in a huge architectural setting. They are all part of a same image – one large epic canvas. If you look at Falk’s website, you will see the work hung as a single work and it reads much better in a larger context. There is high impact on meeting these canvases for the first time. Fresh oranges, reds, burnt Siennas and yellows combine to define the light and dark of the trees. A subtle and less demanding ground roots the large trunks on the overall image. 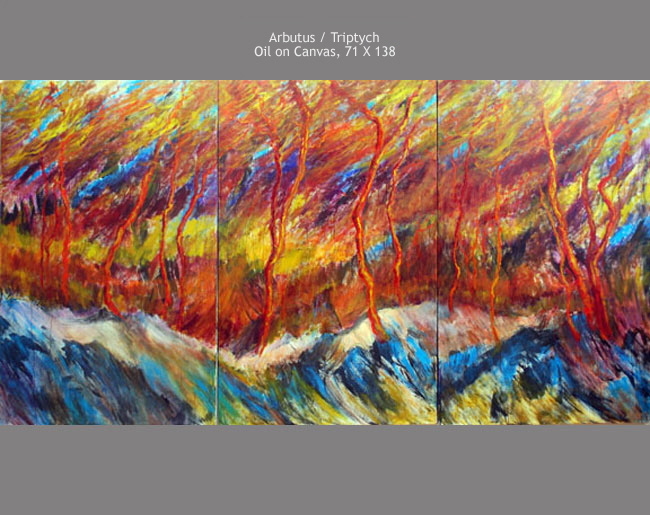 Between the branches, there are shots of pure magenta and cerulean or manganese blue giving the canvases a good cool balance to the fiery branches above. Everything is freely drawn. There is no hesitation in Falk’s brush strokes. Nothing is overworked and the paint stays fresh as if it were just painted and glowing. This artist has all the skills and verve in her technical abilities to fill her paintings with the mood and the feel of these giant orange-barked arbutus trees. Viewed as a whole, this month’s exhibition brings two completely contrasting artists successfully together. The expressionist feel of Falk’s paintings opposes the clean lined minimalism of Bradford’s scultures. The resulting effect was a balanced and interesting show. It’s on until October 5th. Kate Bradford has yet to create a page and I was unable to find anything about her, to date, on the Web. This entry was posted on September 27, 2008 at 11:25 pm and is filed under abstract art, art, art for art's sake, art materials, art methods, art philosphy, color, oil painting, painting, sculpture, Uncategorized. You can follow any responses to this entry through the RSS 2.0 feed. You can leave a response, or trackback from your own site. Wonderful review and nice photos. My wife, Wendy, and I actually did as you suggest and, after purchasing the second Kate Bradford piece in your review, have placed it in our studio boardroom. Good call! Kate, btw, is a brilliant videographer and editor who is working with Wendy on various documentary projects. Thanks for the feedback. I’m so delighted that you were inspired to purchase from Kate. I love her work and she deserves to succeed and to be nourished in her work. Your support of her work has done that.